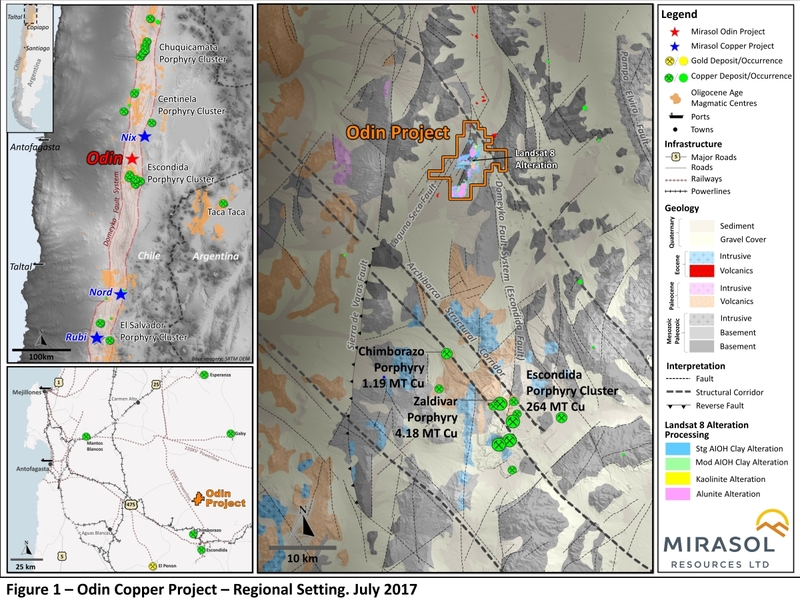 VANCOUVER, BC – July 25, 2017 — Mirasol Resources Ltd. (TSX-V: MRZ, “Mirasol”) is pleased to report that the Company has expanded its claims holdings at the Odin copper project in the prolific Oligocene age copper belt of northern Chile from 900 ha to over 5,660 ha securing significant extensions to the district scale alteration system previously reported at the project. 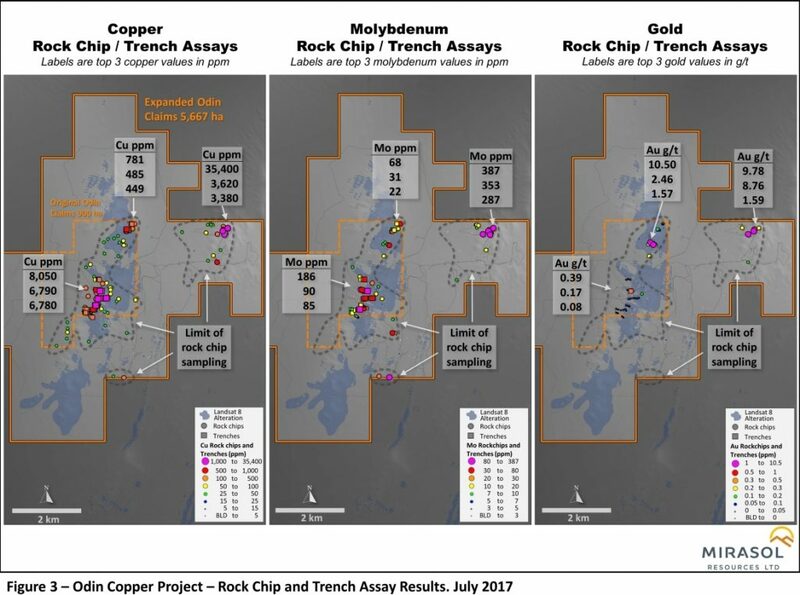 The Odin project is located (figure 1) 35 km north of BHP’s giant La Escondida copper mine giving Odin key operational advantages in infrastructure and access. Odin is localised at the intersection of the Domeyko fault system, a continental scale structure that has influenced emplacement of a number of giant Oligocene age porphyry deposits in Chile and parallel structures to the trans-orogen Archibarca structure. This structural setting is analogous to that of the nearby Escondida copper district. Odin is centred on a large alteration system that is evident from the Company´s Landsat 8 alteration processing (figure 2). Field follow-up with ground based alteration mineralogy measurements and geochemical sampling has defined a previously untested conceptual porphyry target (see news release March 2, 2017) concealed beneath a geochemically barren alteration lithocap at Odin. Recent staking of new claims has significantly expanded the area of alteration controlled by Mirasol at the Odin project from the original 2.6 to 6.5 sq kms. 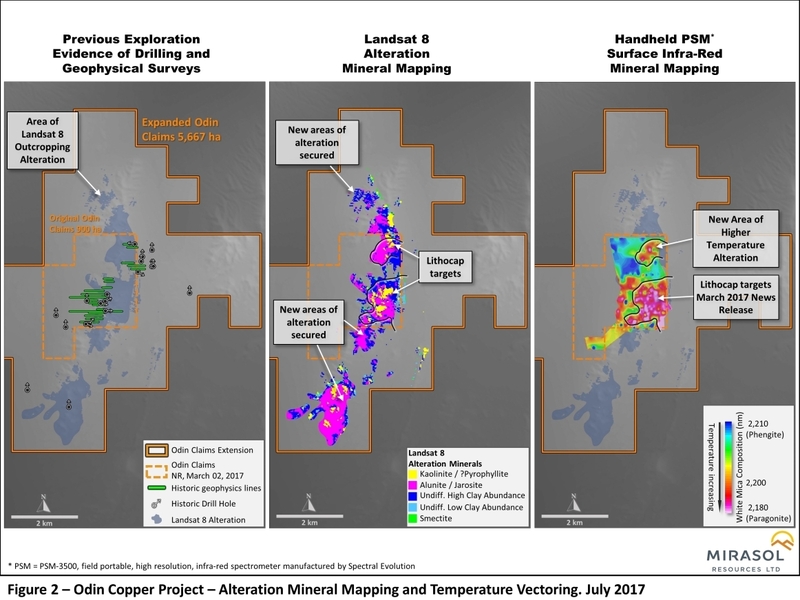 Systematic field exploration will determine if the recently staked claims could potentially host additional porphyry copper targets. Mirasol has expanded reconnaissance rock chip sampling outward from the original Odin target into the new claims. Initial results have returned encouraging Cu + Mo + Au assays (figure 3) from narrow structures that may vector toward new conceptual targets at the project. Detailed analysis of the satellite base alteration processing suggests zoning patterns that could indicate higher temperature centres within the larger alteration system. These areas will be the focus of future exploration. The Odin Project was staked as part of Mirasol’s Chilean copper strategy aimed at building a portfolio of high quality copper projects in the world class northern Chile copper belt. Mirasol has received strong interest in Odin and the recently announced porphyry targets at Rubi project adjacent to the Giant El Salvador copper district. Mirasol is actively seeking joint venture partners to drill test and develop these projects.